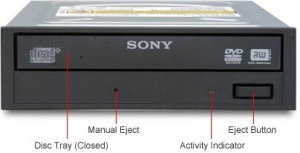 Has your CD-ROM/DVD-ROM drive eaten a CD/DVD, and you can't get it out? If you want to take that CD/DVD out of your CD-ROM, and the Eject button isn't working, follow the steps below to get the disc of your drive. 1. Locate a standard wire paperclip and unbend one side of it. 2. Locate the Manual Eject hole, a small pinhole near the drive door. 3. Insert the paper clip in the hole, pushing it in firmly to release the spring-loaded latch. 4. When the door pops open, pull on the drive bay, but don't force it, until it's open far enough so that you can remove the disc from the drive.